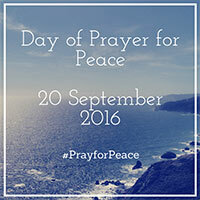 On Tuesday 20 September next, Pope Francis has called for the observance of a ‘Day of Prayer for Peace’. The day of prayer coincides with the Holy Father’s visit to Assisi, Italy on 20 September. The day will centre around the theme, ‘Thirst for peace: faiths and cultures in dialogue’. Representatives from different religions will meet the Holy Father upon arrival in Assisi including, His Holiness Bartholomew I, Ecumenical Patriarch of Constantinople; a Muslim representative; His Grace Justin Welby, the Archbishop of Centerbury; the Syro-Orthodox Patriarch of Antioch; a Jewish representative; and the supreme Head of the Tendai (Buddhists), Japan. The representatives will join Pope Francis for lunch with a number of victims of war. This entry was posted in Bishops, Pope Francis and tagged Day of Prayer for Peace, Pope Francis, St Francis of Assisi on September 14, 2016 by ACBC Communications.